One evening this week, I was sitting at our kitchen table sipping a cup of hot tea, gazing out the back window. As I took a few moments to relax, I noticed the misty damp haze as it drifted across and settled over our backyard. It wasn’t long until the neighbor’s house across the nearby field faded from view. A little while longer, our garden had vanished, and by the time I’d drained the last bit from my tea cup, even the familiar landscaping in our yard was blanketed in mist. 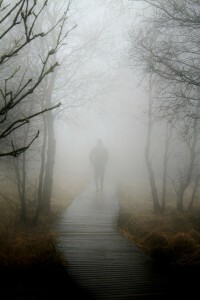 You know, sometimes, walking with God can be kind of like the fog I watched roll in. Often discerning Christ’s leadership and guidance can be as clear and unmistakable as the sun on a cloudless day. But, crisis, fatigue, anxiety or other traumatic life events can cause even the most familiar scriptural truths of our faith to be shrouded by the uncertainty and fade from sight. In those times, it’s easy to get lost and even stumble in what may seem to be unfamiliar territory. When situations blind us to the reality of what is true, we should reach for and hold fast to some clear markers that will help us be sure of our direction, until the sun returns and God’s will becomes more clear. The Word of God. – Regardless of how confusing our situation may seem, God’s Word is the number one way to be sure we’re walking on the right path. Consulting its wisdom will help us continue to make good decisions even in the middle of heartache, pain and calamity. Remember, there is no time, no circumstance, and no reason we should ever do anything that’s forbidden by His Word. Likewise, there is no excuse for neglecting God’s instructions about what to do either. Circumstances – Sometimes God uses the events of our lives to guide us. While that’s not always the case, repeated, providential occurrences can be used to get our attention. We would be wise not to regard these things as simple coincidence. Learn to be sensitive to the Lord’s leading in the subtle things, realizing that unusual events could be the way God moves you toward His will. Wise counsel – There is immense value in having godly believing friends who know and love you enough to speak the truth. That’s especially true when we find ourselves in a confusing position. Remember we’re often too close to our own stories and can’t always think correctly or see clearly enough to untangle the details. The insight of a trusted and godly friend is often just what we need to bring clarity to a hazy situation. Power of the Pause – Logic and reason are generally good barometers to help us cut through the fog and make sound, God-honoring decisions. However, if, after consulting scripture and seeking godly counsel, there’s something that just doesn’t sit right with you, PAUSE. The Holy Spirit may be sending you a warning. Take time to seek God more carefully (and prayerfully) before you move forward. Urgency – Sometimes the Spirit of God will give you a nudge to step out and take action of some kind. While you must be cautious and always keep in mind that whatever you do must be consistent with God’s Word, there are times when God may impress you to go somewhere you’ve never been, speak to someone you don’t know well, or do something out of the ordinary. It’s then when we need to overcome our hesitancy and act in faith… remembering that the Lord may be attempting you to use you as a part of His work in someone else’s life. Peace – Jesus promised to give us His peace. (John 14:27) So, if you’re anxious and restless about a course of action, continue praying and trust God to give you His inner sense of quietness as an indication that you’re on the right track. That doesn’t mean you won’t have a measure of normal apprehension when stepping out in a new direction (especially when you have a hard time “seeing” where your feet will land). But even when your emotions are running high, God’s peace will give a calm stability that’s rooted in the confident trust that He holds you in His hand. This entry was posted in A CLICK A BLESSING TODAY, CHRISTIAN LIFE AND THE WORD, Christian Life and the Word - Know the Truth - Live the Truth, CHRISTIAN TAGALOG BLOGS, CHRISTIAN TEENS BLOGS and tagged anxious, God's peace, God's will., guidance, Holy Spirit, quietness, scripture, Truth, wise counsel, Word of God, worry. Bookmark the permalink.